FarSounder is the first commercially available forward-looking sonar system that scans the area in front of a vessel and displays the seafloor and in-water obstacles in three dimensions. The system is comprised of a transducer, power module, and graphical user interface (computer display program). The center frequency of the sonar is 60 kHz. Forward-looking sonar systems are designed for surface ship navigation and obstacle avoidance. These systems are mounted on the bow of the vessel. Although these sonar systems are primarily used in shallow water navigation, they may also be useful in reducing the likelihood of hazardous disasters such oil spills, reef groundings, and whale strikes. The FarSounder sonar detects and displays (in three dimensions) the seafloor and any in-water obstacles at up to 300 meters (1000 feet) in front of the vessel. Multiple angles looking forward from the vessel allow areas just under the surface to be detectable in all but the highest of sea states. With a single ping, a three-dimensional (3-D) depth map is generated within a vessel’s 90° horizontal field of view, and the range, horizontal angle, and depth of targets is measured. 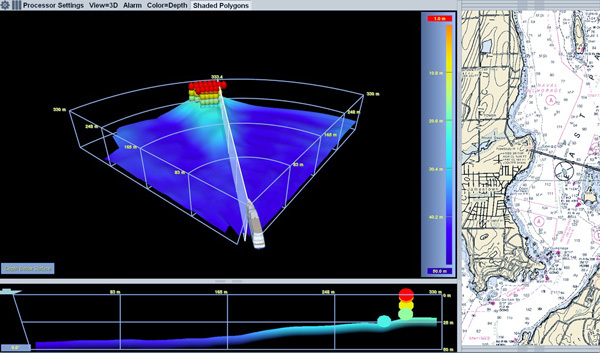 This screenshot from the FarSounder FS-3 obstacle avoidance sonar shows relatively flat bottom at a depth of about 40 meters. The top plot is the 3D rendering of the seafloor and obstacles while the bottom graphic is the 2D depth profile along the Profile Selector (the white plane ni 3D plot). In the distance, at a range of about 300 meters, a bridge piling from the Newport Bridge (in Rhode Island) can be seen dead ahead. The colors indicate depth from 40 meters (blue) to 0 meters (red). The sonar has field of view of 90 degrees. The components of the system include a transducer, power module, and graphical user interface. The transducer is mounted to the bow of the vessel. Data are displayed in 3-D on a computer screen inside the vessel.